(AP) -- A sobbing woman pleads for police to “please hurry” because a man was breaking into her front door during a 911 call recorded moments before a responding officer shot and killed an unarmed man outside. 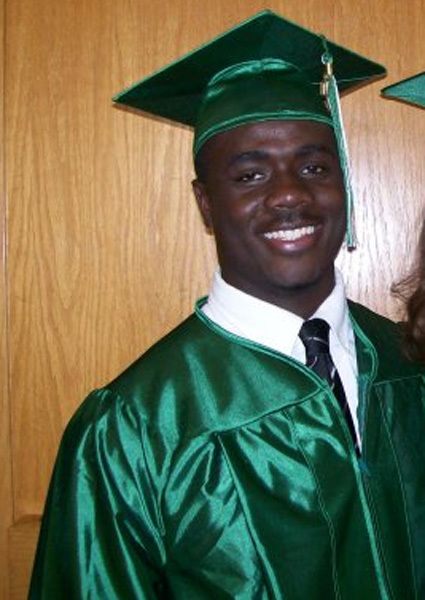 Authorities said Jonathan A. Ferrell was shot 10 times by a Charlotte-Mecklenburg officer after being involved in a single-car wreck. Police have said Ferrell may have been seeking help and made no verbal threats to the woman. Officer Randall Kerrick is charged with voluntary manslaughter. His lawyers were in court Tuesday for a first appearance on the charge. Kerrick, 27, did not attend. The judge scheduled an Oct. 7 probable cause hearing for Kerrick. Kerrick joined the police force after working as an animal control officer. He grew up in nearby Cabarrus County. Kerrick and two other officers responding to the breaking and entering call found Ferrell on a road that only leads to the neighborhood’s pool. Ferrell ran toward the officers, who tried to stop him with a Taser. Police said he continued to run toward them when Kerrick shot him. Ferrell died at the scene. On the 911 tape released by the city, the woman tells a dispatcher that she thought her husband had returned home around 2:30 a.m. But when she opened the door, a man tried to get in. The dispatcher tried to calm her down, repeating over and over that they were on the way. He also asked her to describe the man. She told him he was black, about 210 pounds and wearing a green shirt. At one point, the woman told the dispatcher about her baby. “He’s in his bed. I don’t know what to do. I can’t believe I opened the door…Please don’t let him get my baby,” she cried. When police arrived at the scene, she peeked out her window. And when the officers began looking for a man, the dispatcher assured the woman they weren’t leaving. On Monday, Ferrell’s family said in their first public remarks in the case that the former Florida A&M University football player moved to Charlotte about a year ago to be with his fiancee and was working two jobs. He wanted to go back to school and eventually become an automotive engineer, they said. The encounter was set in motion around 2:30 a.m. Saturday when Ferrell’s car ran off the entrance road to a suburban neighborhood about 15 miles from downtown Charlotte. After crashing his car into trees, Ferrell kicked out the back window and headed up a hill to the first set of closely-clustered houses he could see. He then started “banging on the door viciously” of a home to attract attention, police Chief Rodney Monroe said. The shooting of an unarmed former Florida A&M football player in Charlotte, N.C., began with a 911 call from a terrified woman whose front door he had knocked on, possibly seeking help, the tape of the emergency call released today shows. The man, now identified as Jonathan Ferrell, 24, had crashed his car nearby and arrived at the woman’s house to ask for help around 2:30 a.m. Saturday, police said. The woman, who was alone in the house with her sleeping child, told the 911 operator that the stranger approached her front door and she opened it, thinking it was her husband coming home from work, and then slammed it shut when she saw the man. The opening of the door set off the alarm on her home, and the man began yelling for her to turn off the alarm, she told the operator. The woman was frantic about how to defend herself if he attempted to come inside. When police arrived at the woman’s home, Ferrell began running toward one officer, according to the police account of the incident. According to police, when Ferrell began running at the officer, one cop tried unsuccessfully to Taser him. When that failed, another officer fired his gun, shooting at Ferrell 12 times and hitting him 10 times. Ferrell died at the scene. The gunshots are not audible on the 911 tape. Officer Randall Kerrick turned himself in and was charged with voluntary manslaughter. His attorney said today that he is confident Kerick’s name will be cleared.